The 20th of June 2009 was the day when changelogs found their way into readme.txt files of plugins in the WordPress plugin repository. Thanks to Peter Westwood und Mdawaffe a new version of the readme.txt example file was available online that had an example of the changelog in action. For many many people a changelog is a very important thing; it is all about justifying to your users why they should upgrade to the latest version of a plugin. That's why I created the little plugin called Changelogger. It shows the latest changelog right on the plugin listing page, whenever there's a plugin ready to be updated. Upload the folder changelogger/ to your /wp-content/plugins/ folder. Upload the folder changelogger/ to your /wp-content/plugins/ folder and overwrite the existing file. The changelog on a plugin update is being shown if the plugin author added a changelog section based on the new readme.txt example file to their plugin. I love the plugin, although it appears that the changelog needs to be from the newest version to the oldest, is there a way to have the plugin parse the correct readme file? the ‘correct’ example readme file suggests listing changelogs from the newest version to the oldest, so that is how my plugin’s trying to parse the readme. Sadly this plug-in is not working here. Notice there is an update for Contact Form 7 and the changelogger plug-in is activated and yet no change log info is displayed. 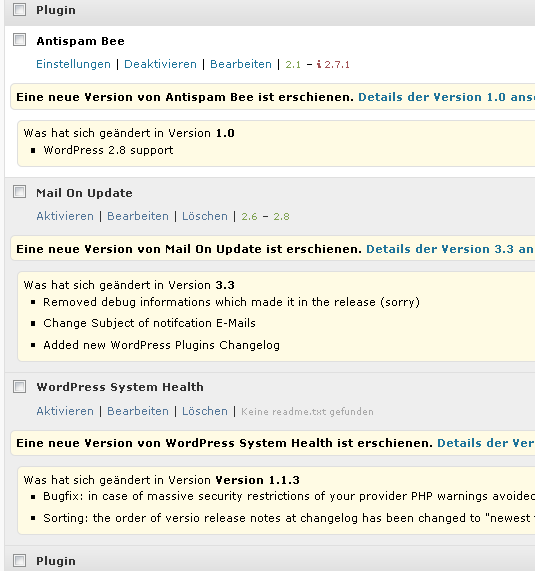 Perhaps it’s because I am running WordPress 2.8.1 beta 2? Have to use this version atm because of my host. Darn bug in WP 2.8.
no bug. It’s just that the plugin author added a changelog section to his plugin’s readme.txt file, but did not fill it properly: http://wordpress.org/extend/plugins/contact-form-7/changelog/ He just added a link which my plugin can’t parse. Well, I will try to add validation in the upcoming version, checking if the readme.txt changelog section can be parsed (and is not just a plain link 🙂 ). I just installed the plugin, sounds very useful. I have one suggestion: Could you add a link to the plugin’s revision log in the WordPress Plugin Trac? This would be useful especially for plugins without changelog, but also interesting for plugins which have a changelog. If you have the plugin’s slug, you can easily compose the URL like this: “http://plugins.trac.wordpress.org/log/$slug/trunk”. Would be great if you could add that. Oliver, excellent. Now I understand. Oliver, this is excellent. I hope it becomes part of the WordPress core soon! First of all, great plugin – I use it on all my sites. I noticed something today: I had a plugin at version 1.4. The newest version was 1.5.1, but it also had a 1.5 version in between. The problem is that Changelogger only displayed the changes for 1.5.1 and didn’t include the ones for 1.5. Do you think you can correct this? the problem with displaying every version note between the currently installed plugin version and the latest available is that it would definately be too much of information. Just downloaded the new version. Interesting solution to the screen space problem. Only trouble is that you have to wait a while each time you click the navigation. Wouldn’t it be possible to load the entire readme upfront, instead of getting bits through AJAX? Also, I noticed that when you click back, an AJAX request is made again, instead of caching the results. well, I’ll see if i’ll provide an alternative way of displaying the changelog, but as for me the AJAX’y way of displaying changelogs is a valid way of handling the huge amount of changelog data along with other plugin-specific data on the plugin page. Recently Changelog stopped working – it says that changelog section exists but is not readable. Could you fix this? thanks for letting me know. I guess you’re running on PHP4? I fixed the error with version 1.2.7 that should be available in a few minutes. Thanks Oliver. I am able to activate version 1.2.7. Would it be possible to add support for when bulk updating plugins from /wp-admin/update-core.php ? Solid plugin, however after one recent update, I notice that all the “v”s in the changelog message for each plugin on the “Plugins” page is omitted. Has anyone else experienced this? Yeah, confirmed. Didn’t notice that before. 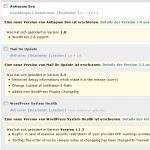 I’ve updated to WordPress 3.0 and Changelogger no longer is showing on the Plugins page. I’m not sure if it is a conflict with another plugin or not. That’s correct. Now there very well could be a conflict with another plugin and I haven’t gone through deactivating them one by one to check that. Not showing up here either..
Not showing up at all, or not showing up for specific plugins? I haven’t had Changelogger show up for any plugin that has had an update since I went WP 3.0. Same for me. I will try if deleteing and reinstalling Changelogger helps. Version 1.2.9 should fix this issue for 3.0. Sorry it took so long. I have updated to the new version 1.2.9 and it no works on WP 3.0 like a charm. Thanks! I’ve installed 1.2.9. Now I just have to wait for one of my plugins to issue an update. Thanks! Changelogger doesn’t work for me anymore. I can send you a screenshot and more details (plugins installed, etc) if you want, send me an email! The changelog plug in worked fine for me, after following all these questions and answers, thanks to all of you. Maybe there’s no plugin updates available? 😉 Working fine for me. I do consent to the storage and processing of my name, email and comment content by schloebe.de in order to process my comment. We don't sell or give away your data to third parties. I have informed myself here about the exact scope of the data processing. I have the right to object to this use at any time under the contact details given in the imprint.